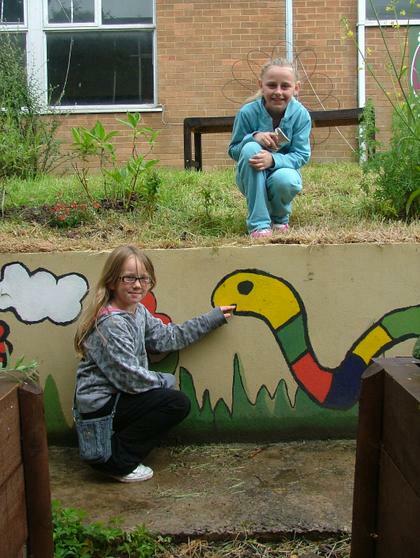 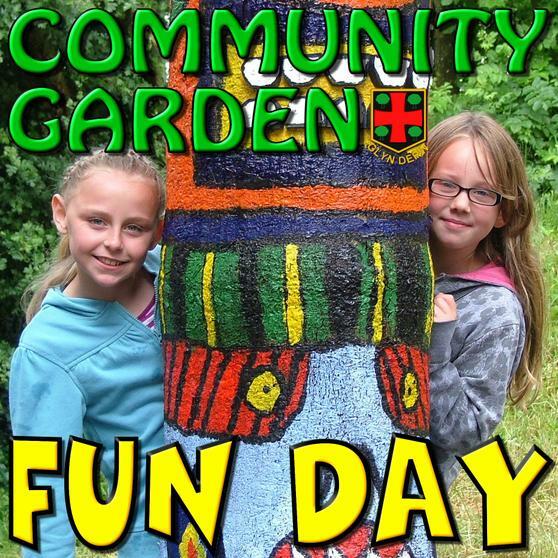 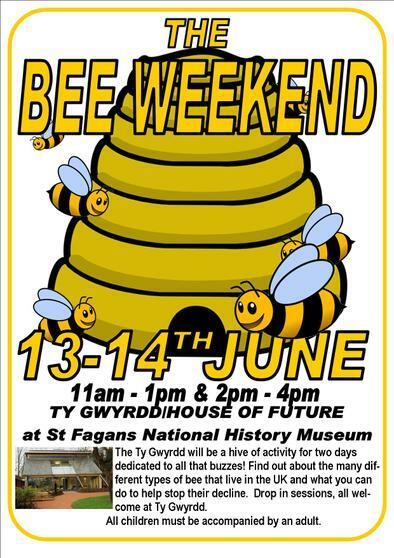 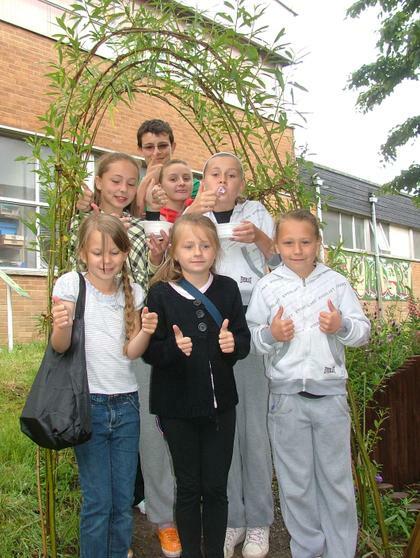 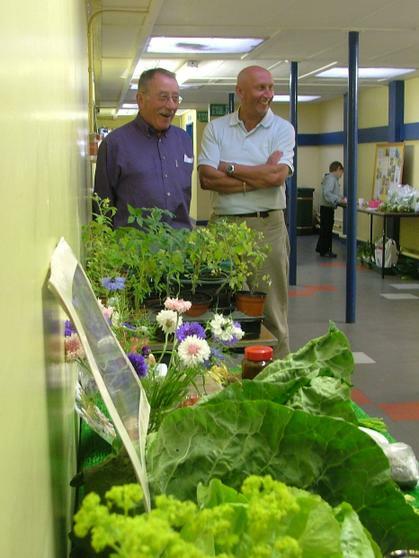 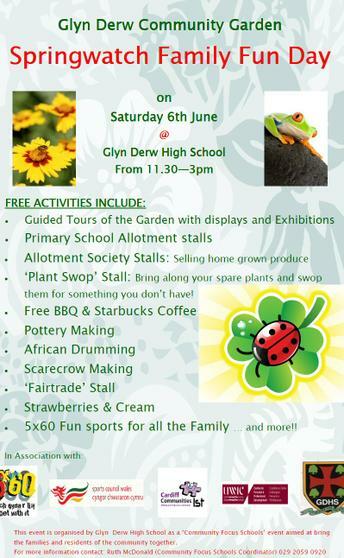 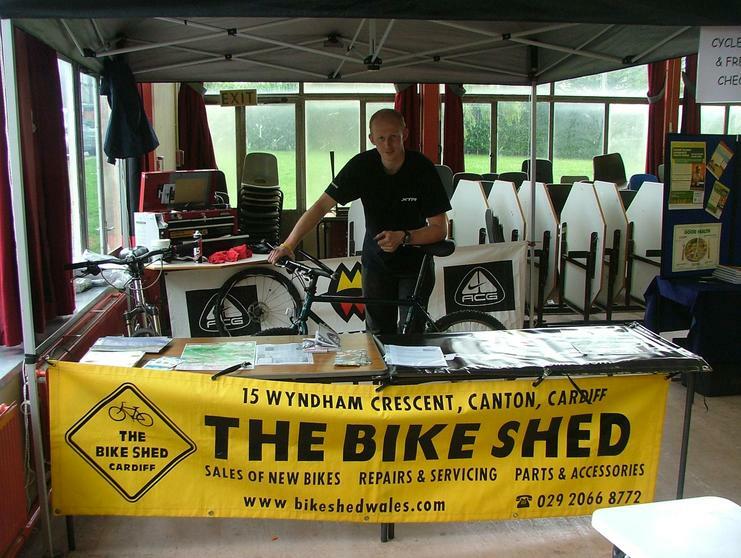 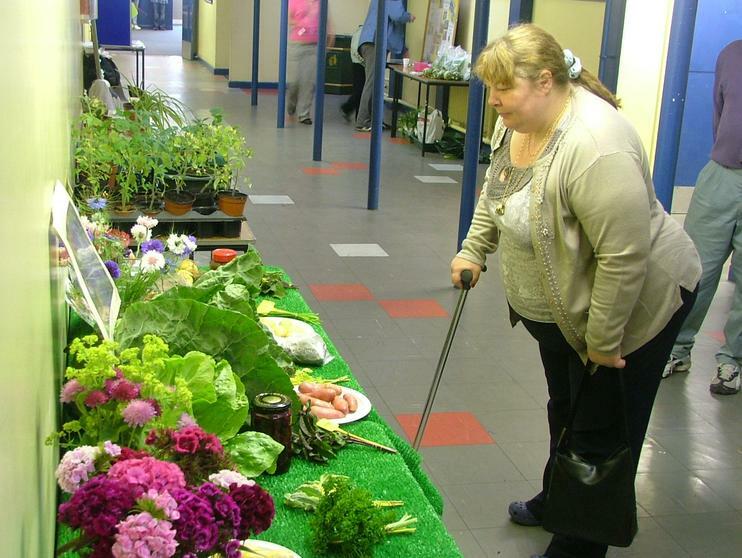 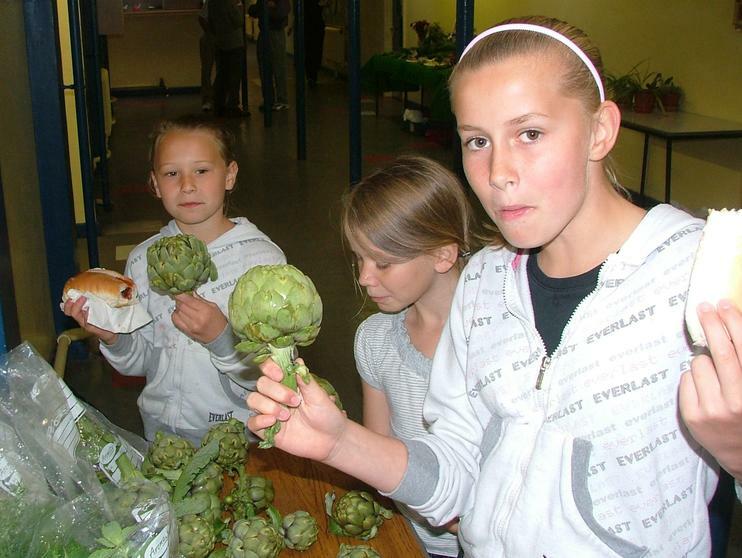 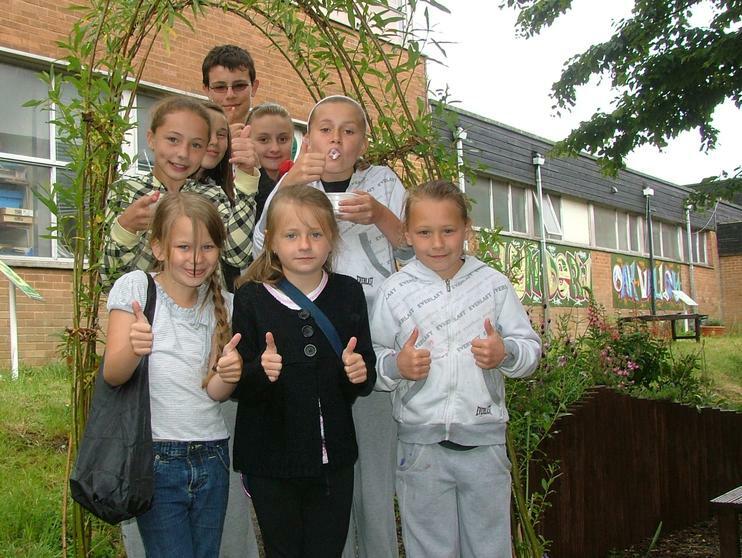 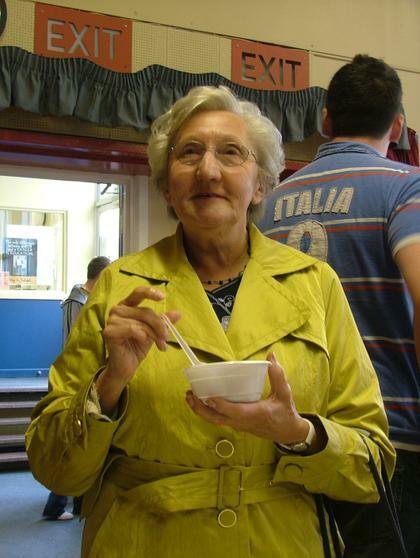 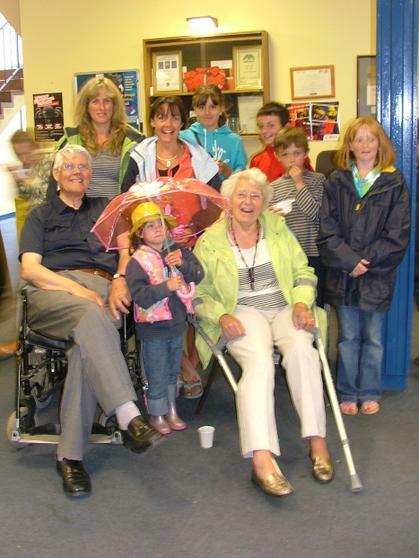 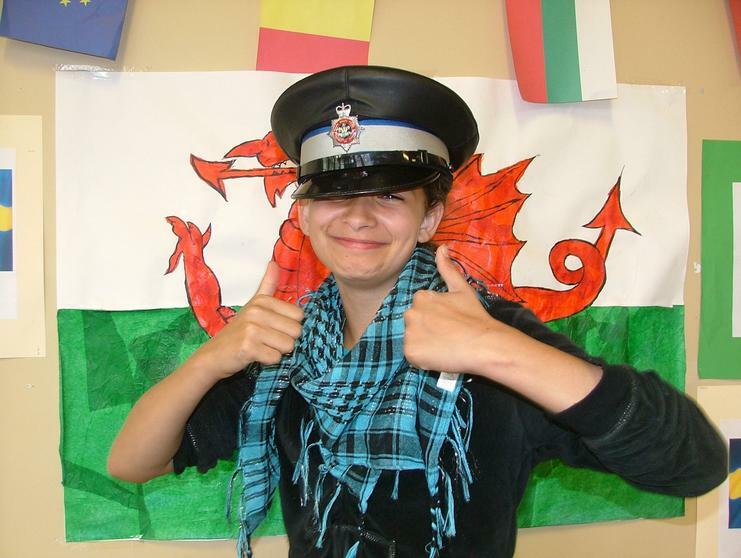 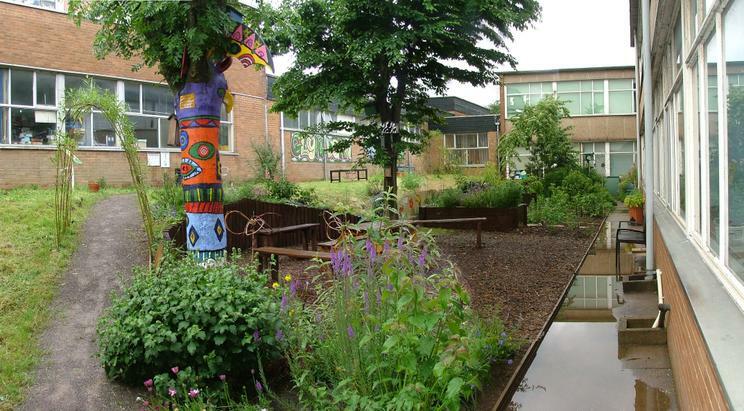 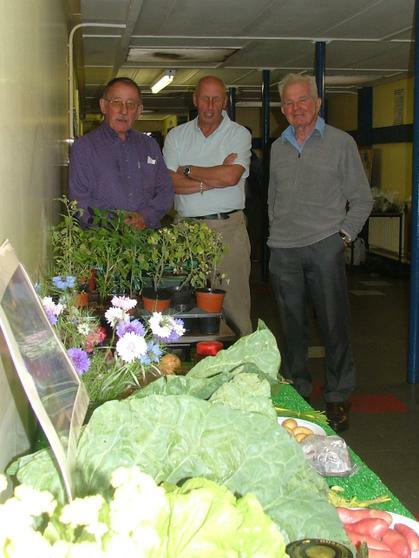 On Saturday 6th June our local high school Glyn Derw opened its doors to the community again so everyone could see the great work that has gone on at the Garden. 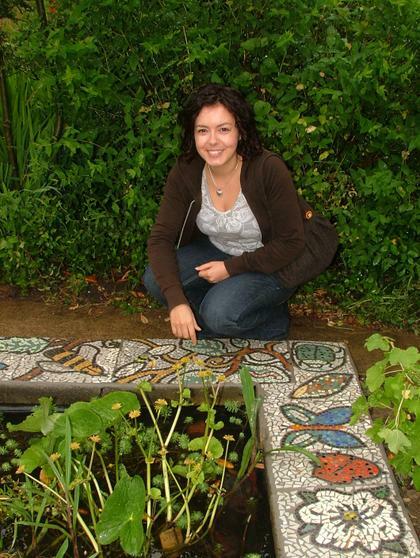 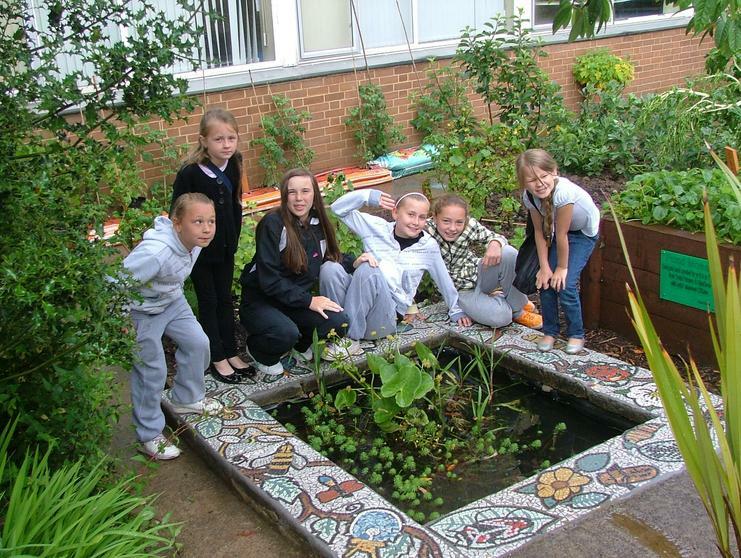 The garden is a wonderful community resource. 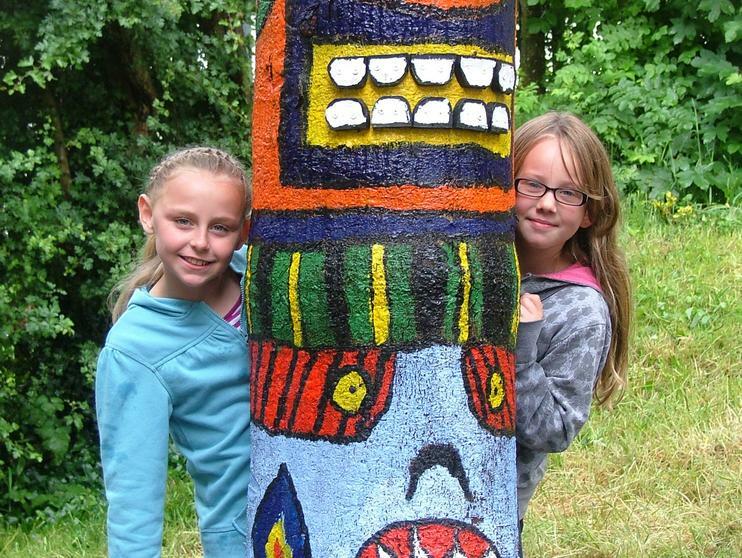 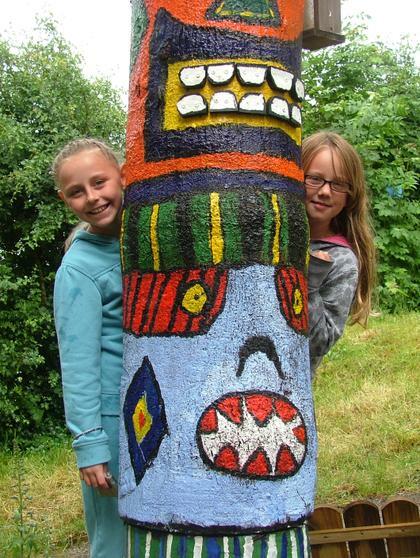 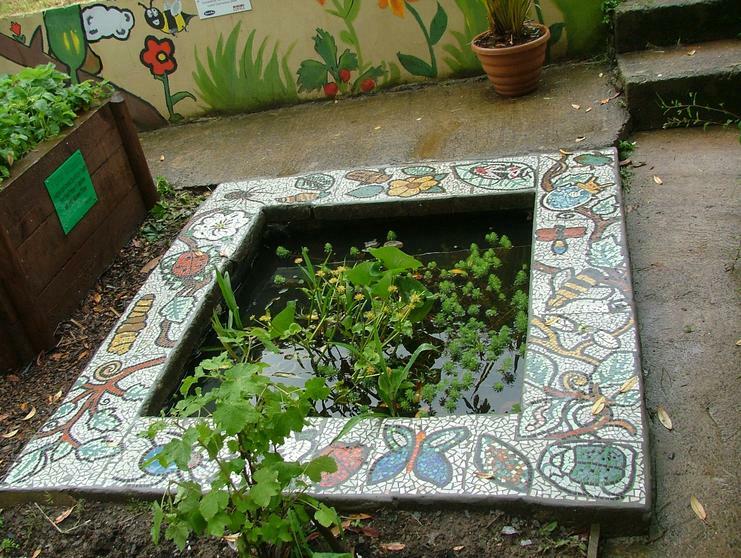 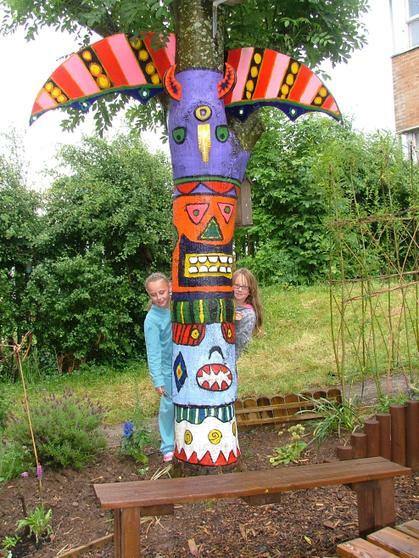 The beautiful mosaics around the pond were made in conjunction with our neighbours Trelai Primary, whilst the brightly coloured totem pole was made by us last year. 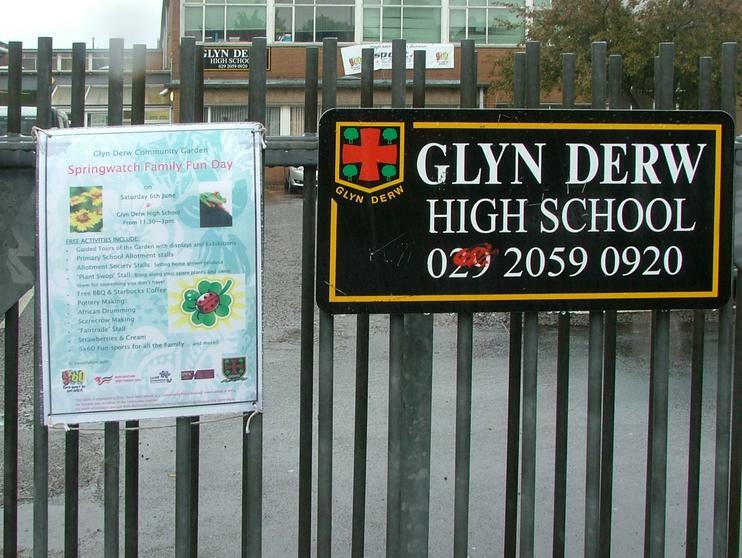 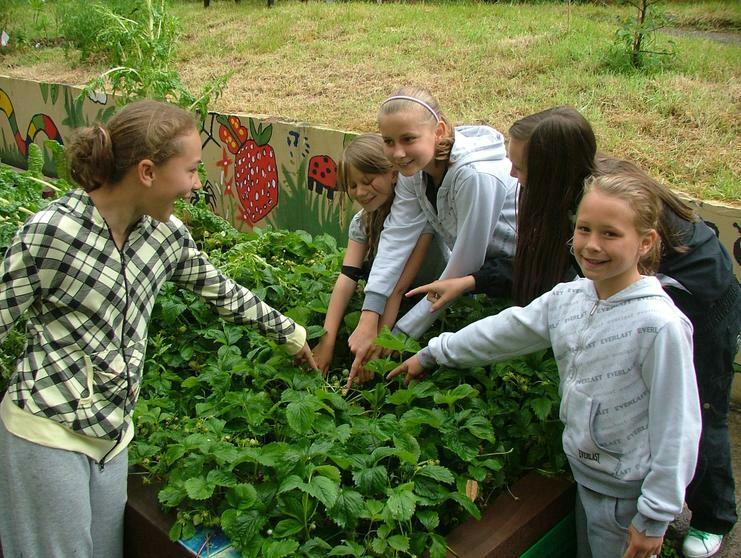 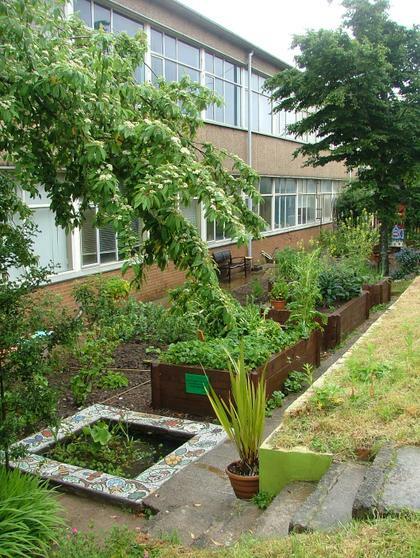 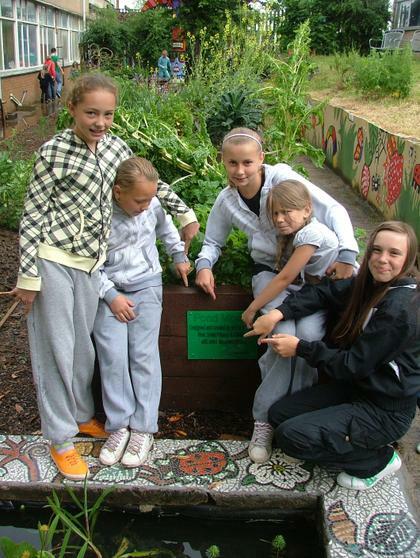 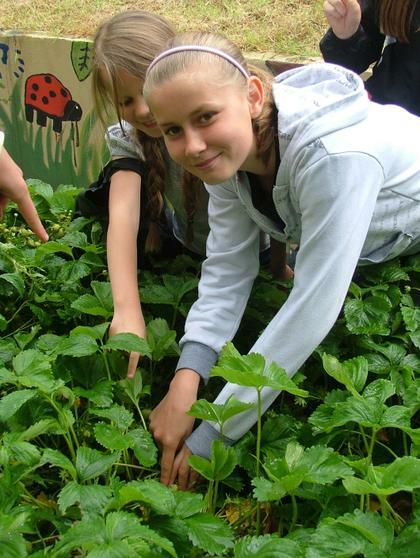 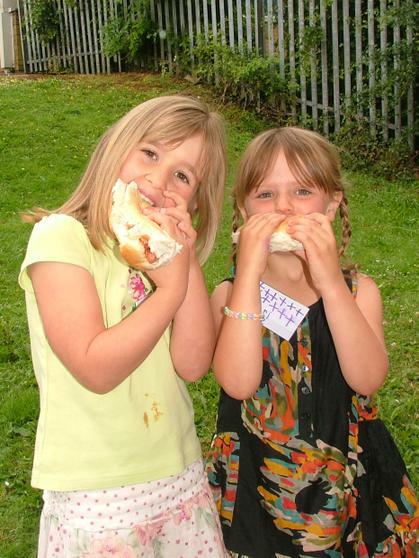 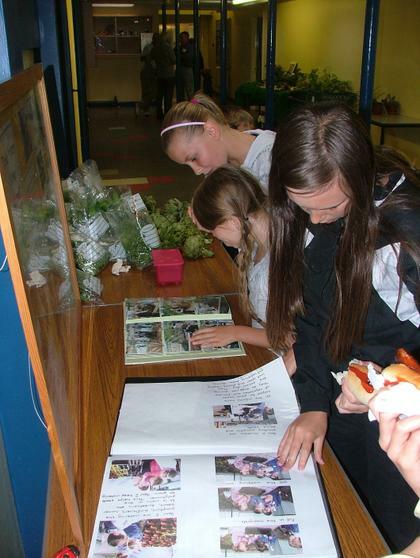 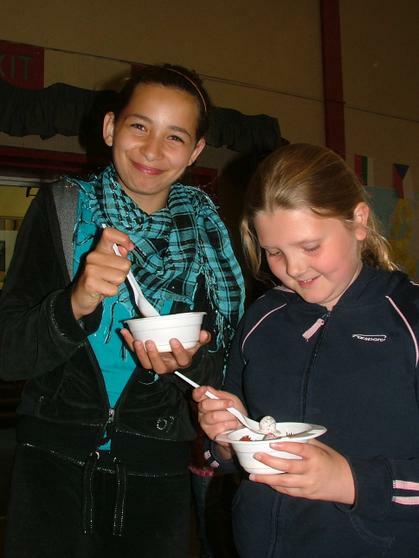 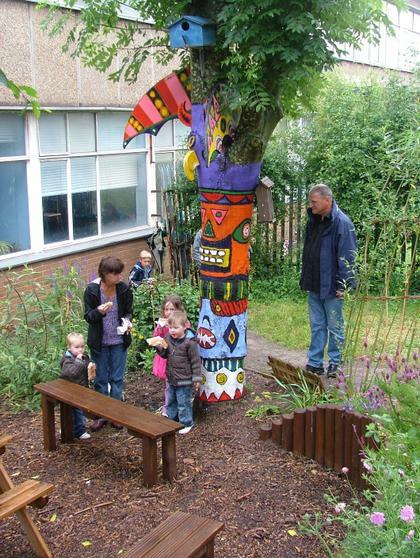 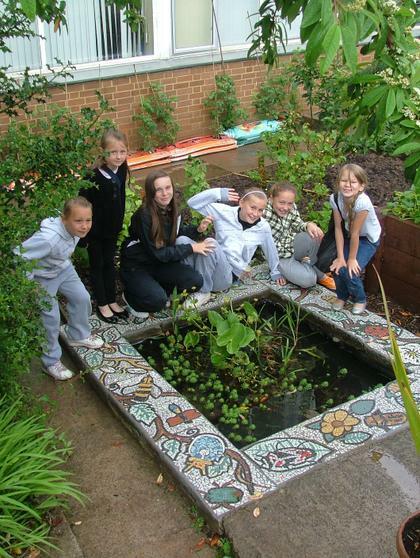 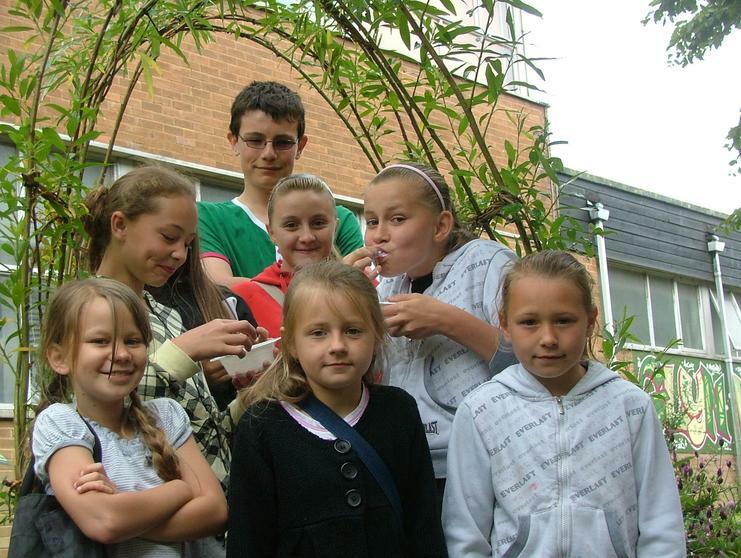 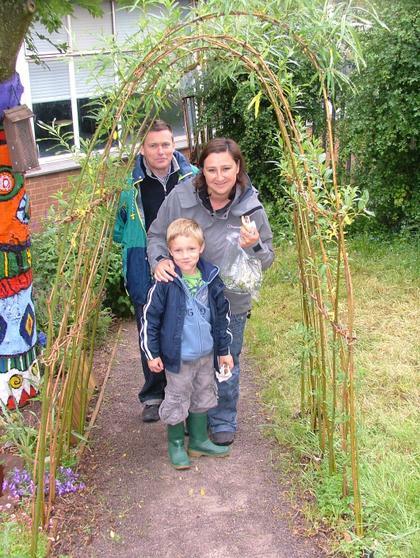 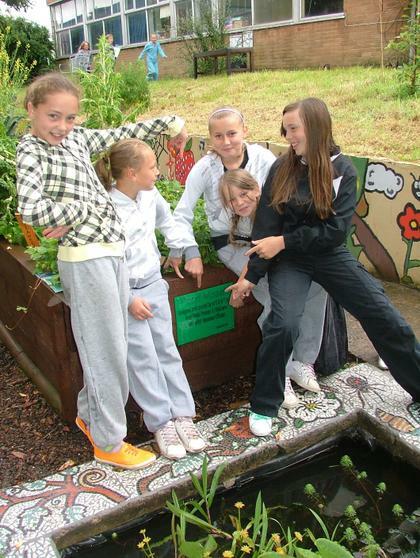 The garden is of course used by clubs at Glyn Derw to grow their own fruit and veg and as an outdoor classroom. 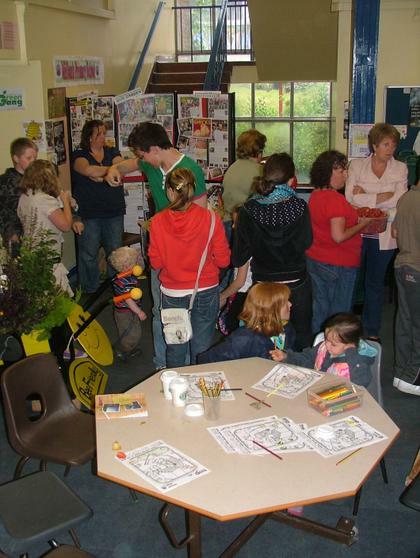 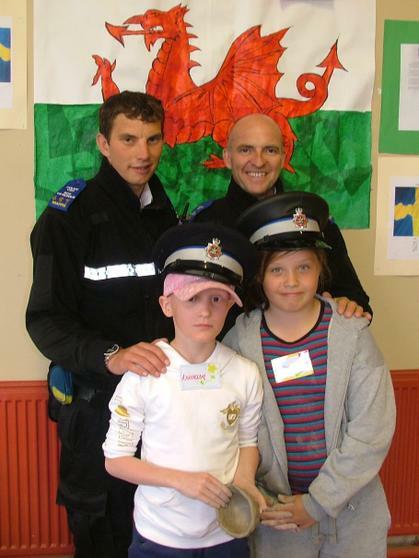 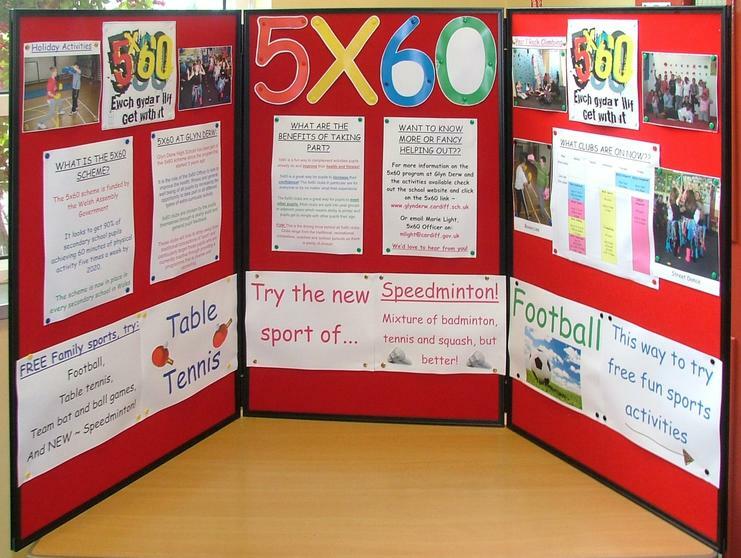 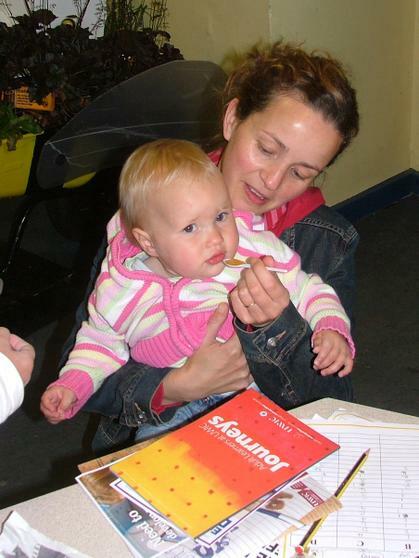 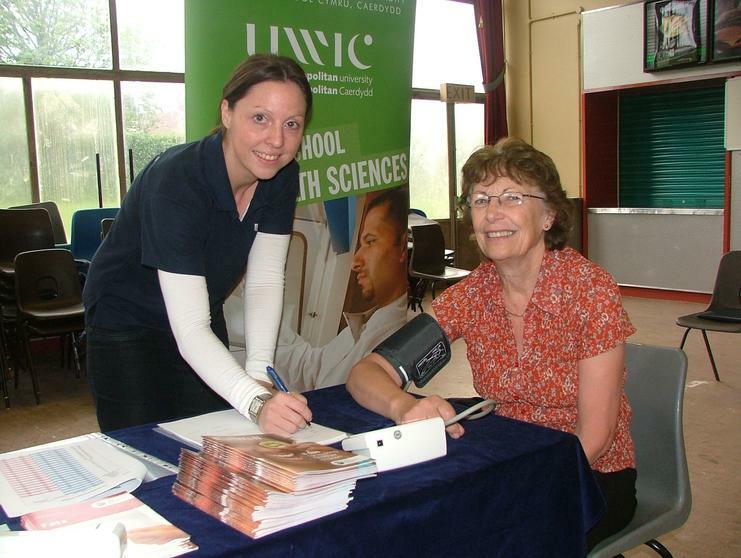 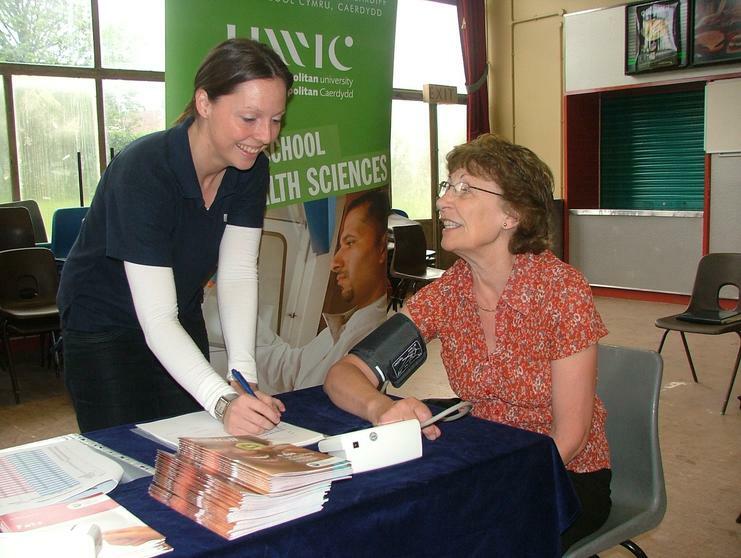 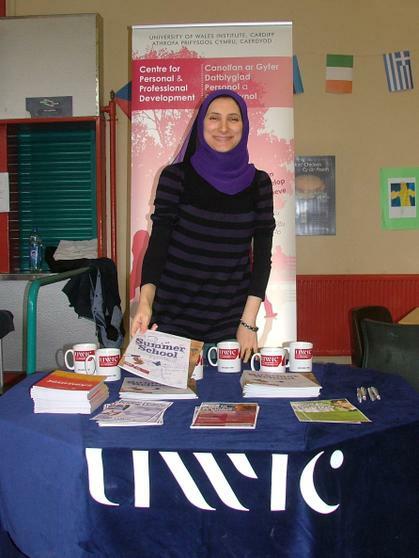 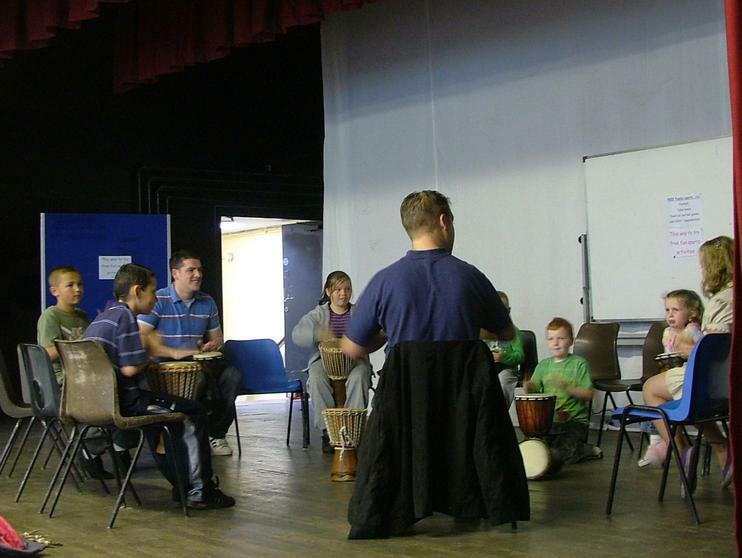 It is available to community groups in the area too. 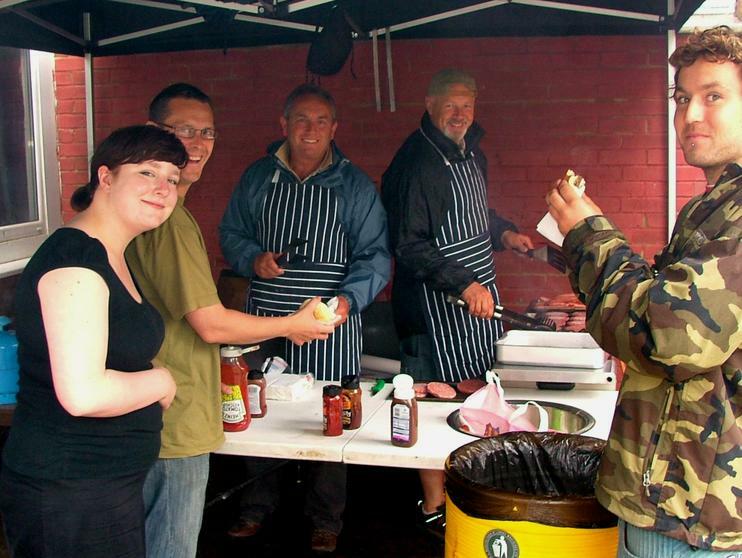 The weather was dire to say the least but around 300 people turned up. 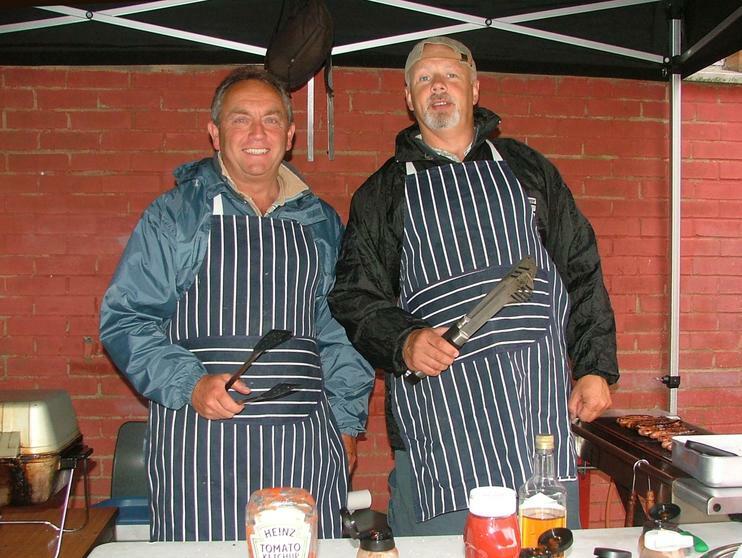 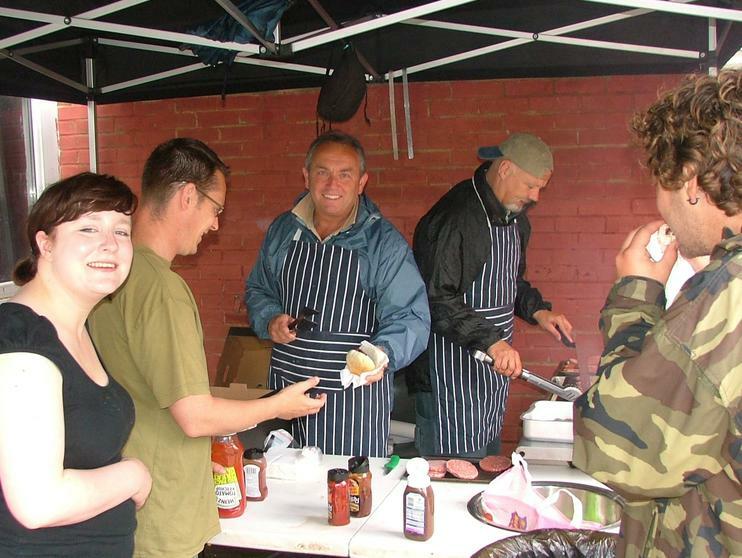 The barbeque- staffed appropriately by Mr McDonald- was busy throughout the day cooking sausages and burgers. 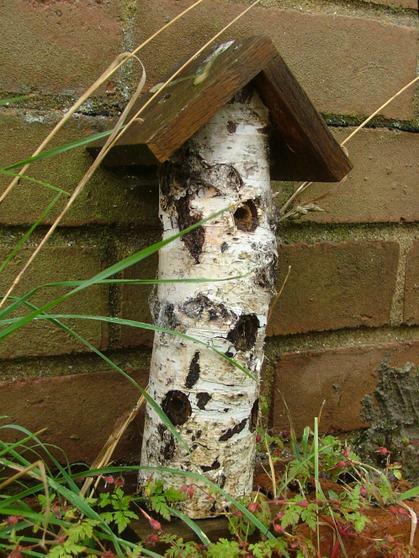 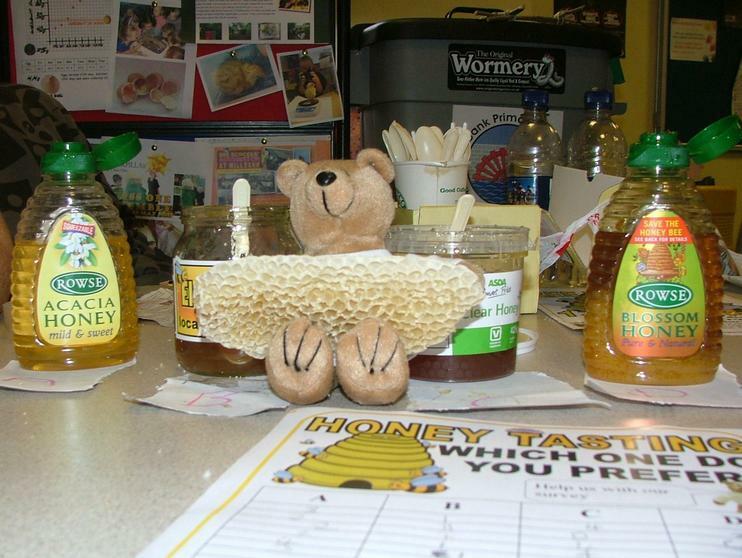 One of the most popular was donated from a local bee keeper, this was followed by the Acacia and Natural honeys from Rowse. 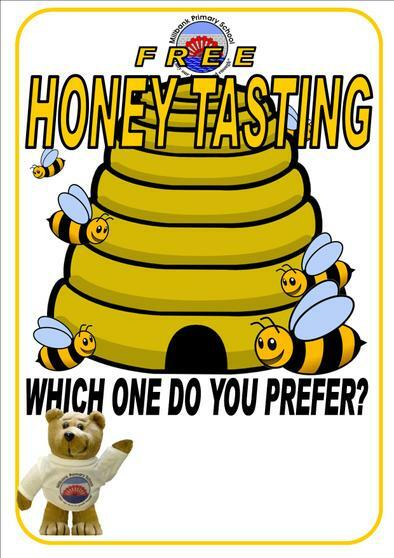 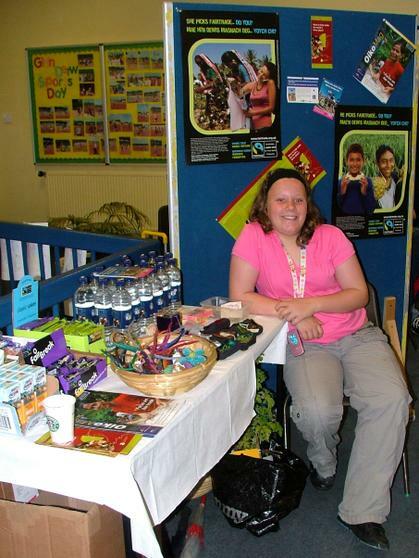 Remember that all schools can get their own free taster kits from Rowse. 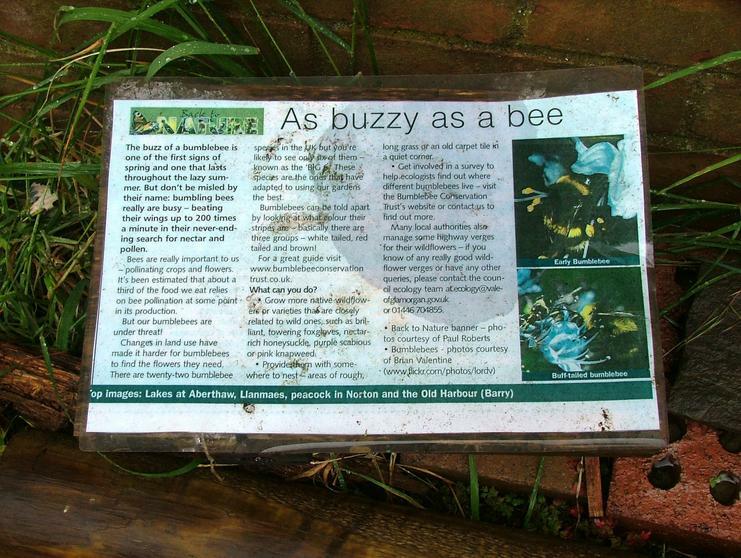 Green gang's 'Bee friendly wheelbarrow' was on display most of the flowers had now overgrown so whilst the banding theme was not visible they still attracted a few bees even inside! 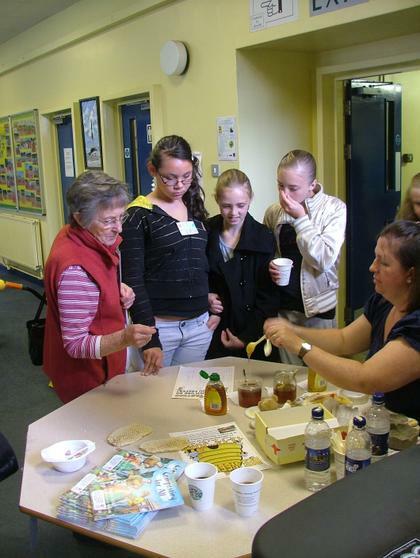 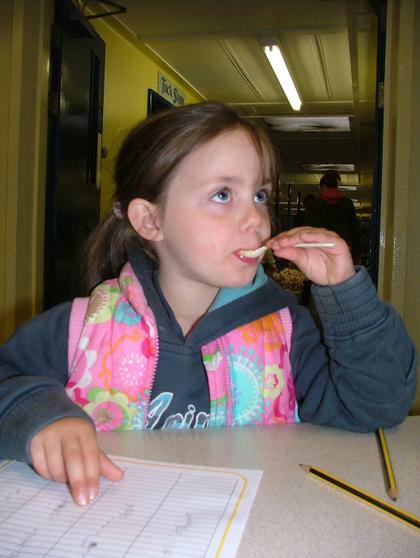 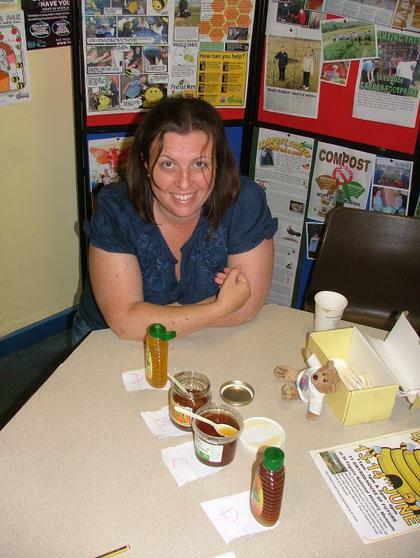 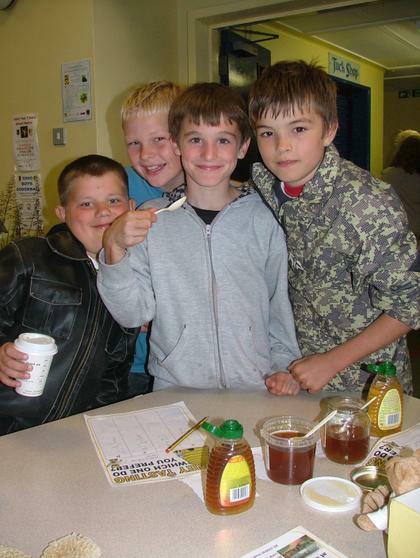 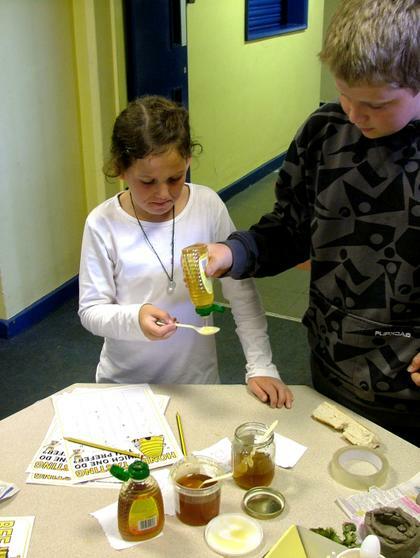 The children liked looking at the honey comb made by the bees from wax. 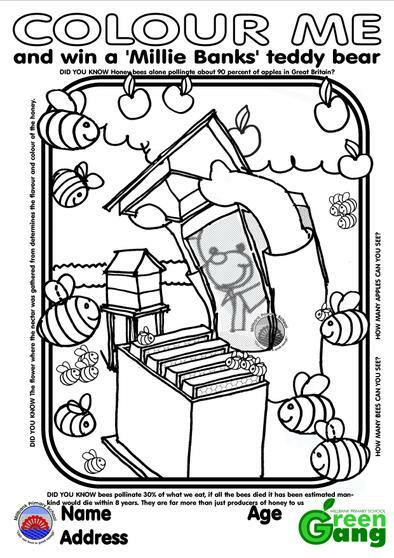 The bees actually sweat it in the form of tiny scales which they collect and form the tightly packed cylinders which take on the hexagonal form we all recognise. 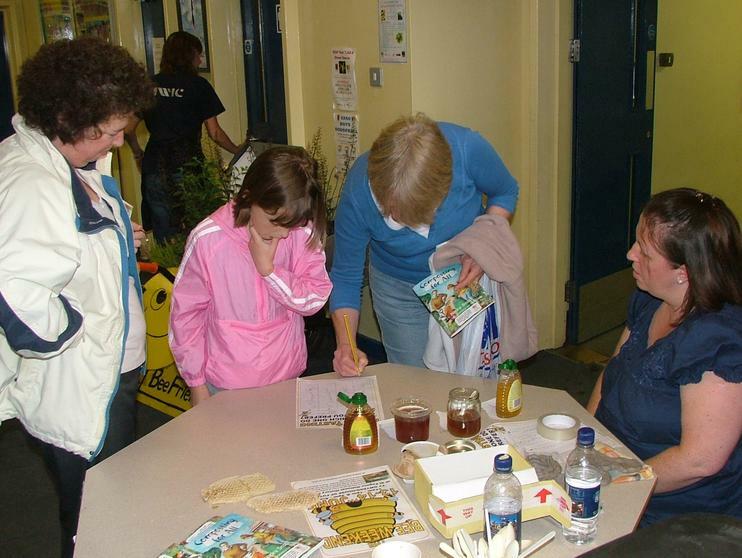 The economic value of crops grown commercially in the UK that benefit from bee pollination is estimated at approximately £165 million per year. 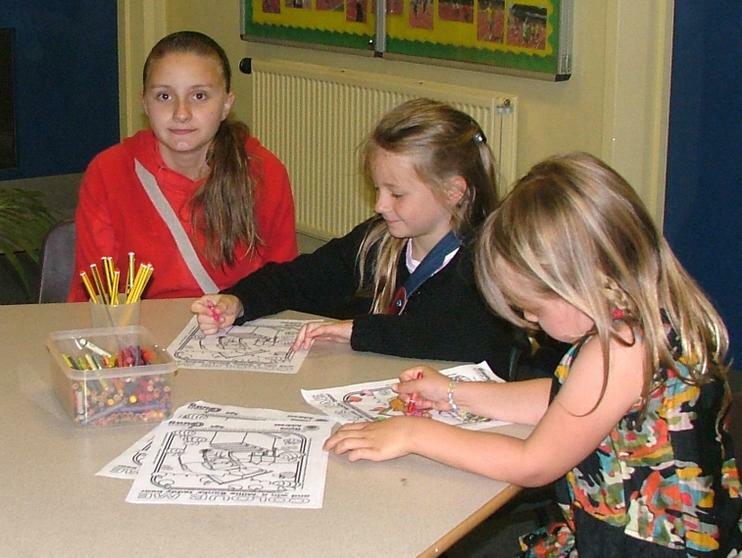 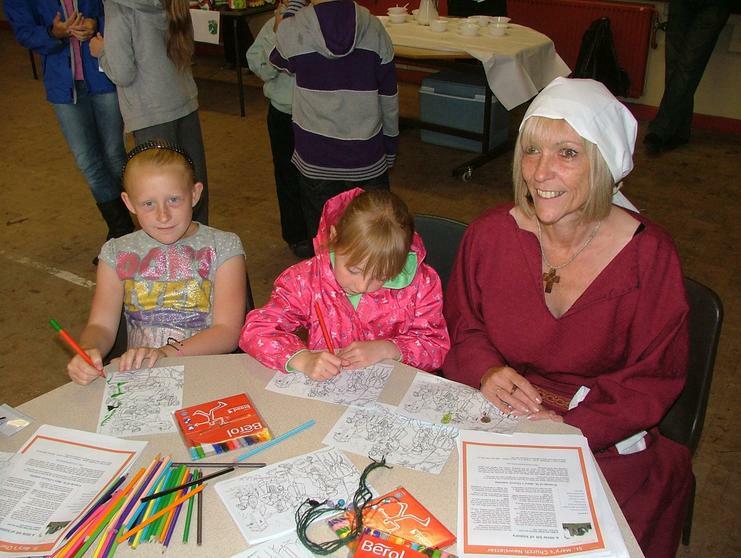 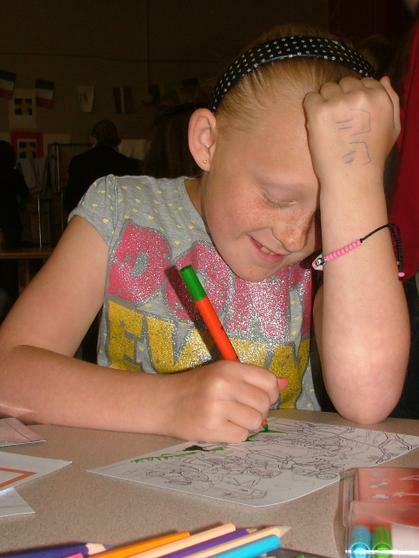 The colouring competition was good fun too. 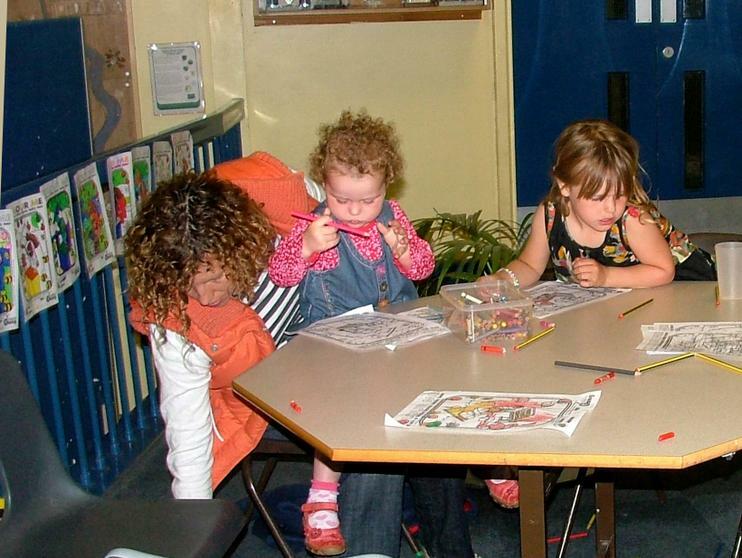 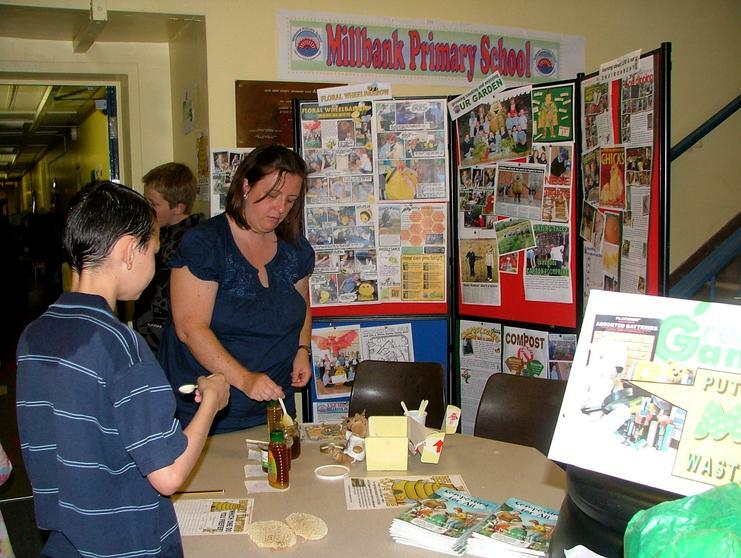 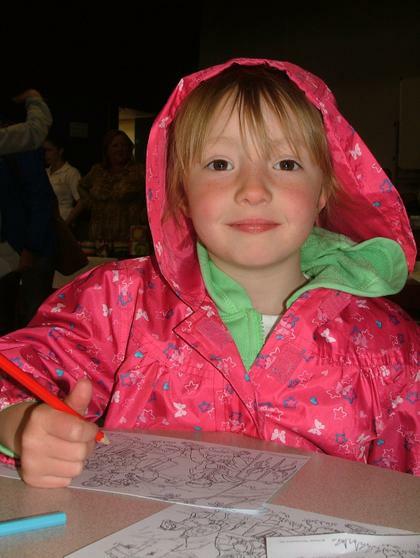 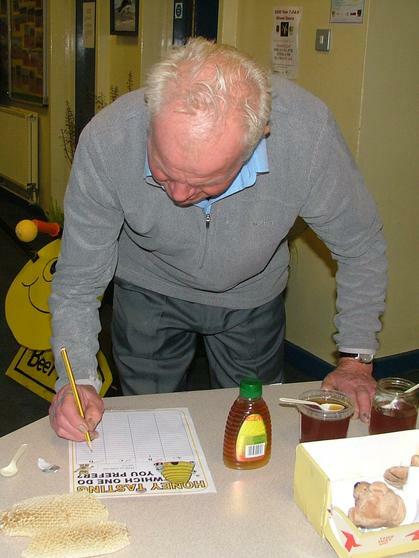 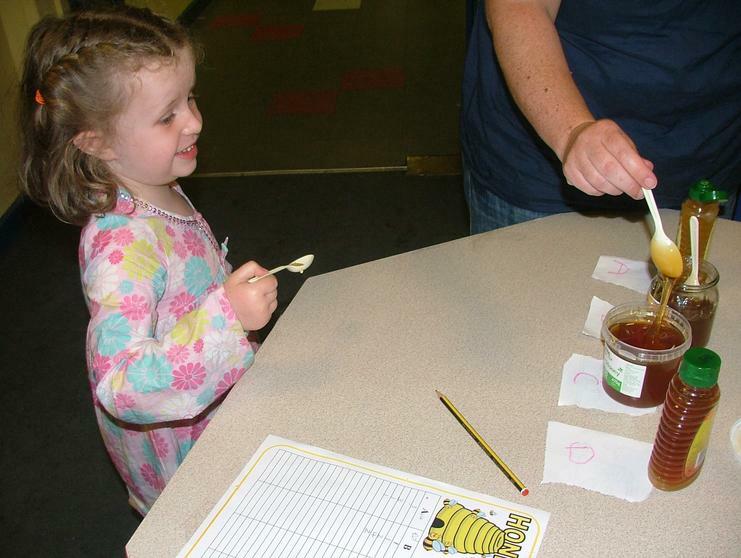 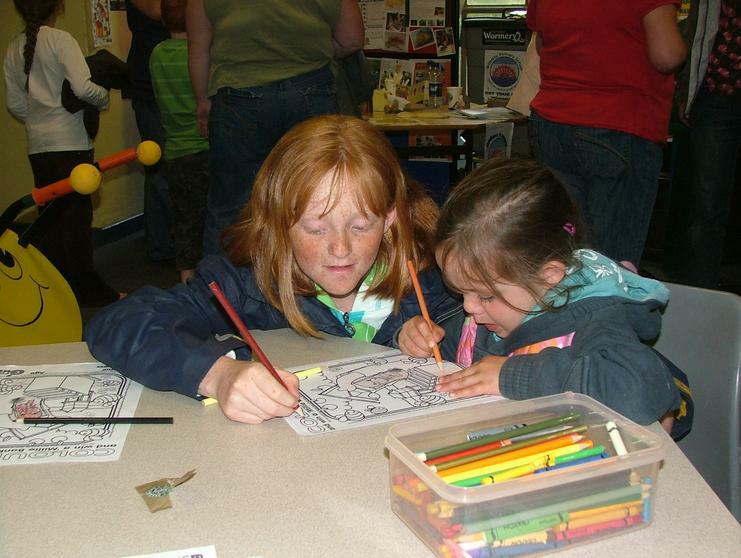 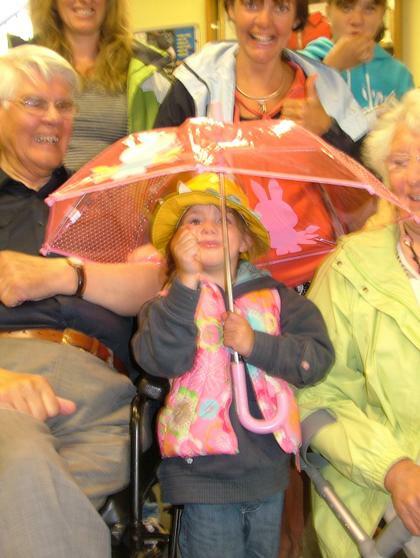 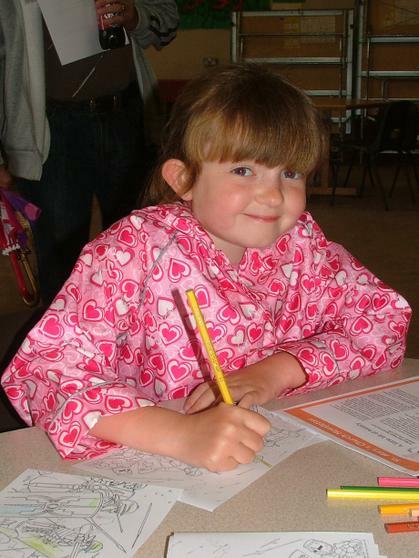 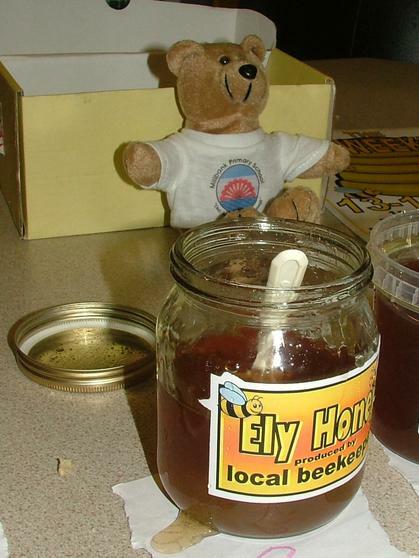 We had a picture of Millie busy doing some bee keeping for people to colour in and win a 'Millie Bank' bear. 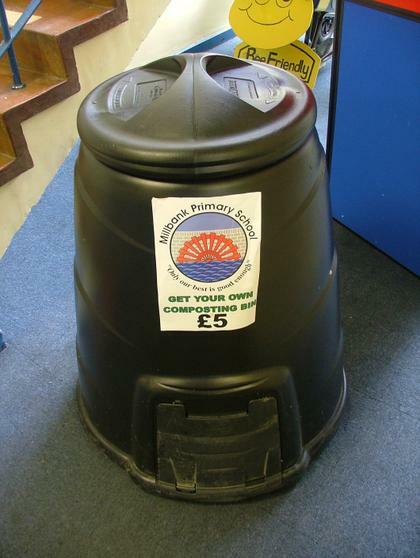 Green Gang had also decided to promote Cardiff Council's Compost Bins available from Lamby way for just £5. 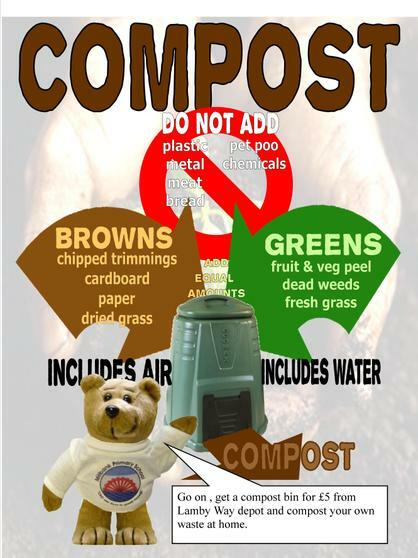 They cost far more in the shops but better still you get top grade compost for your garden and help the environment. 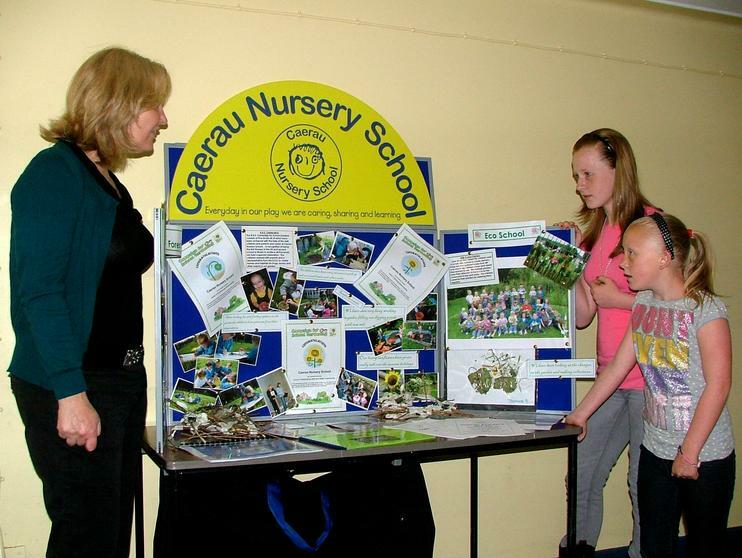 Green Gang gave out leaflets and advice. 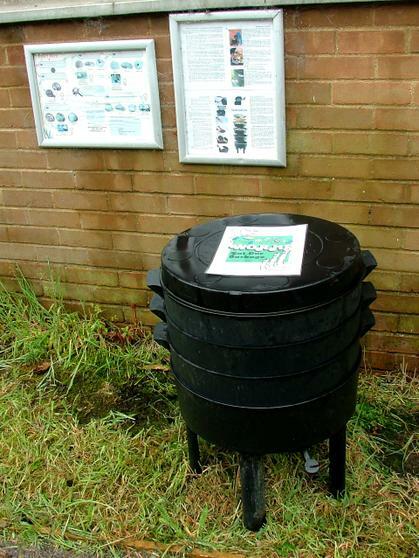 The wormery is also on offer for £20 complete with baby tiger worms and compost to start you off and in no time you will have fabulous liquid plant feed for all your plants and no kitchen waste that will need to be collected by the council and put into landfil. 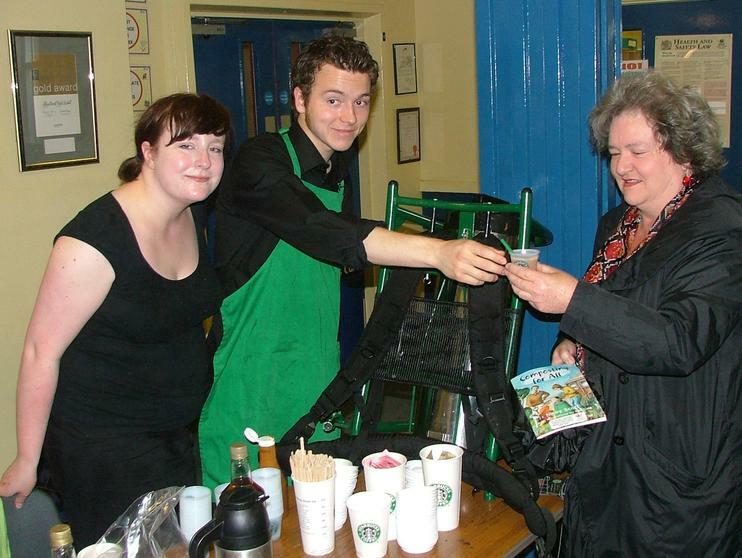 There were lots of refreshments on offer Starbucks from Penarth had come along to give out some coffee and frappacinos. 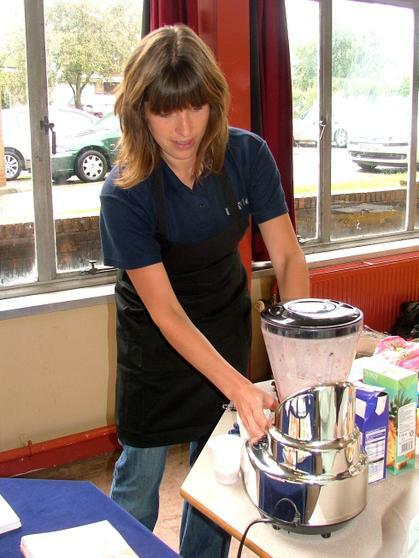 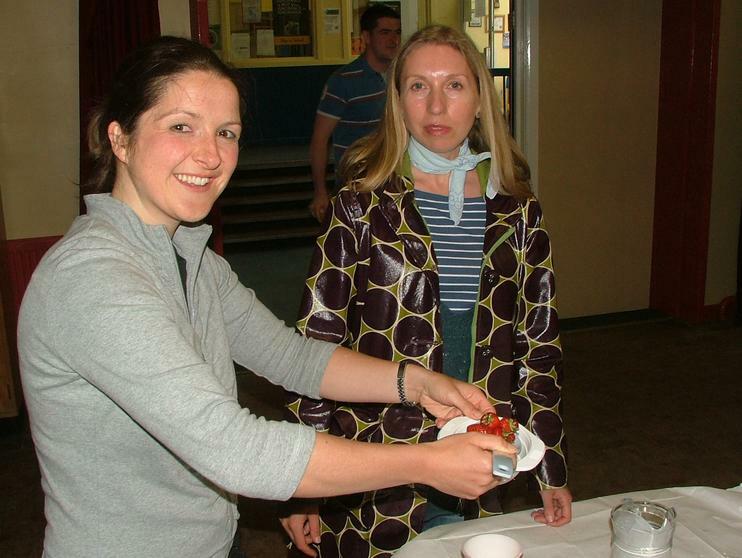 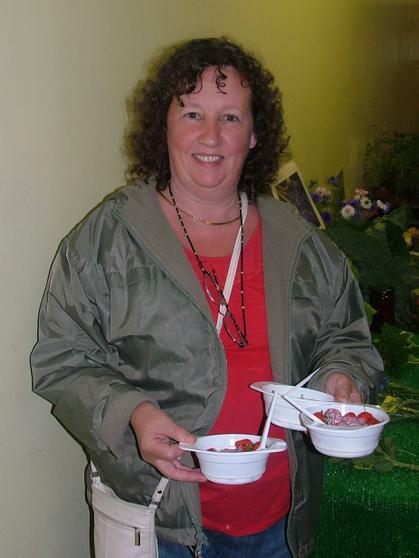 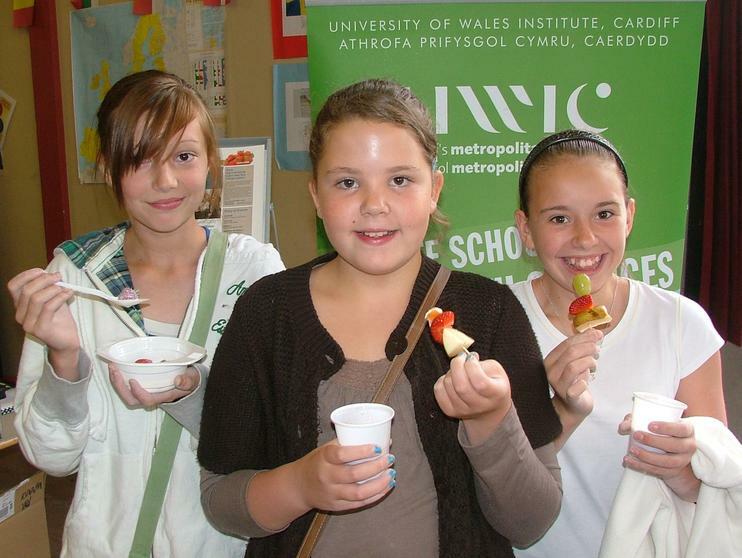 Strawberries and fresh cream were especially yummy as were the healthy fruit skewers and fresh fruit smoothies from UWIC. 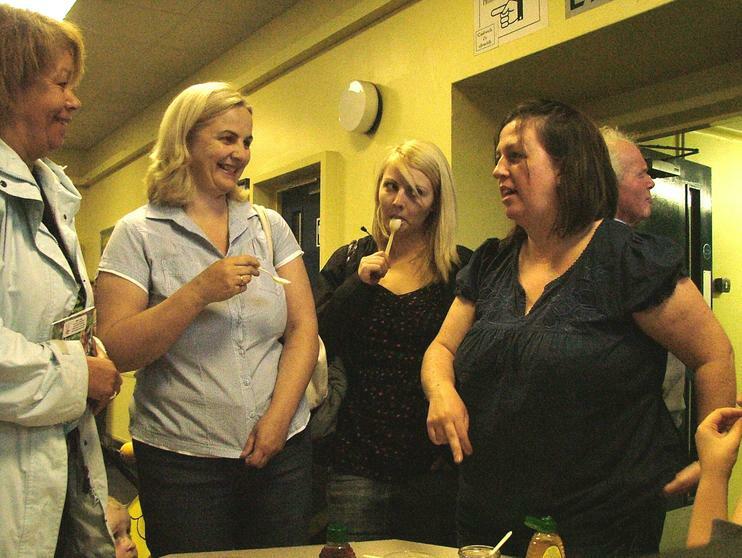 The ladies of VISIT were busy all day giving out free back and feet massages. 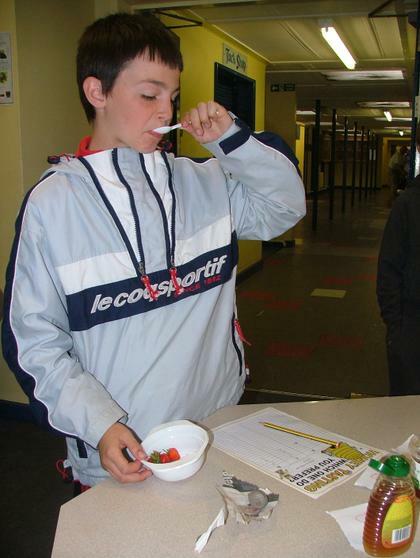 This was a very popular activity all day. 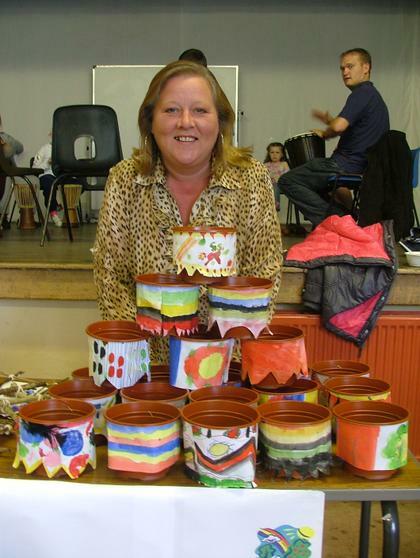 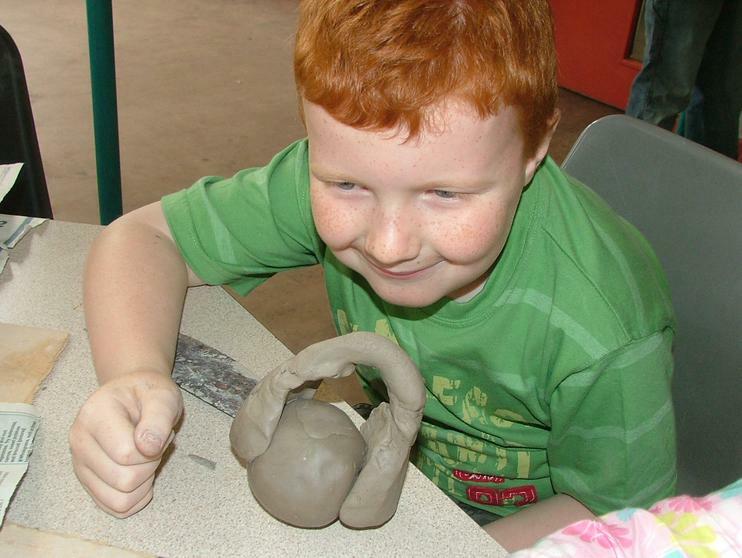 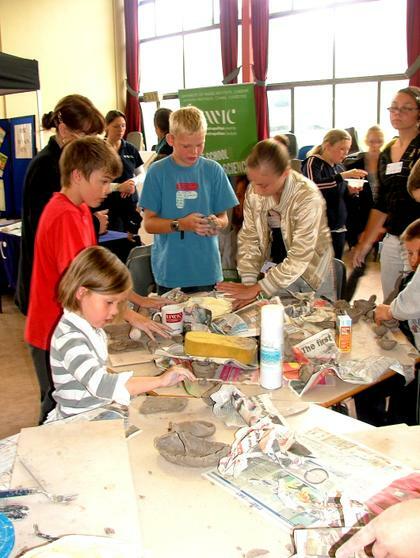 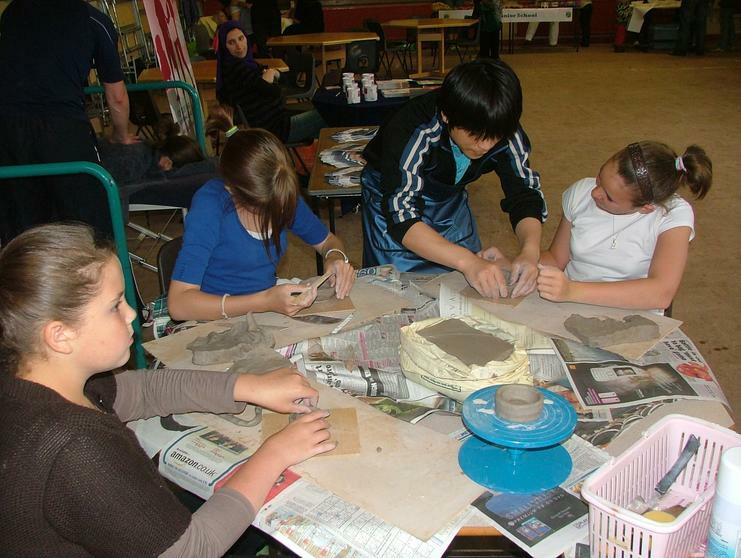 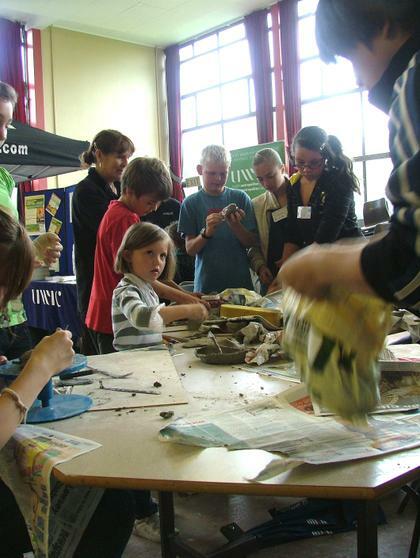 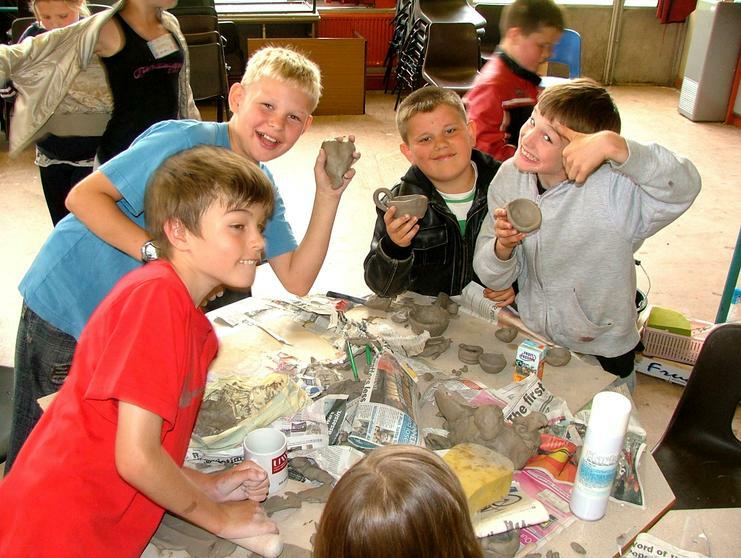 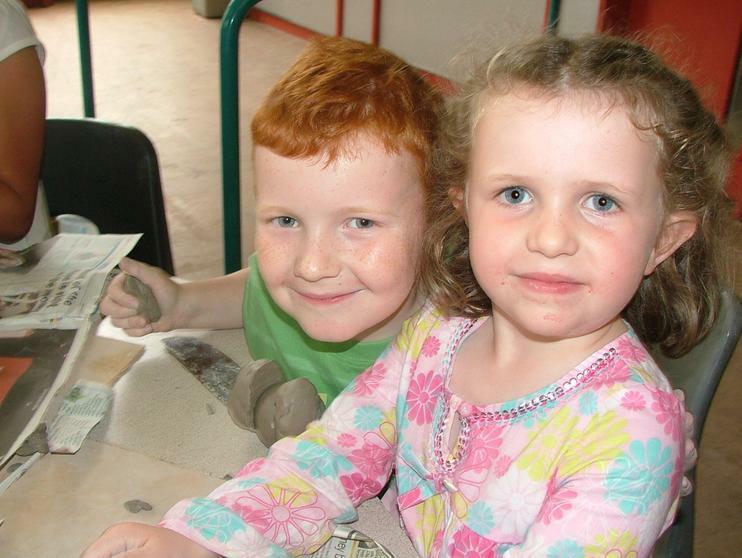 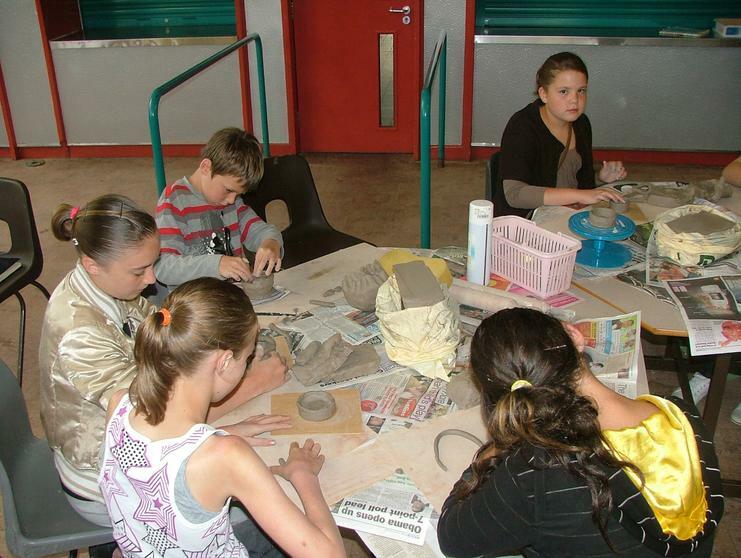 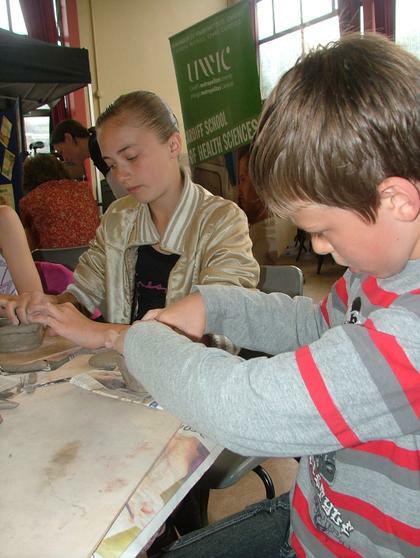 In the main Hall there were lots of activities courtesy of UWIC, many children enjoyed making pots and figures out of clay. 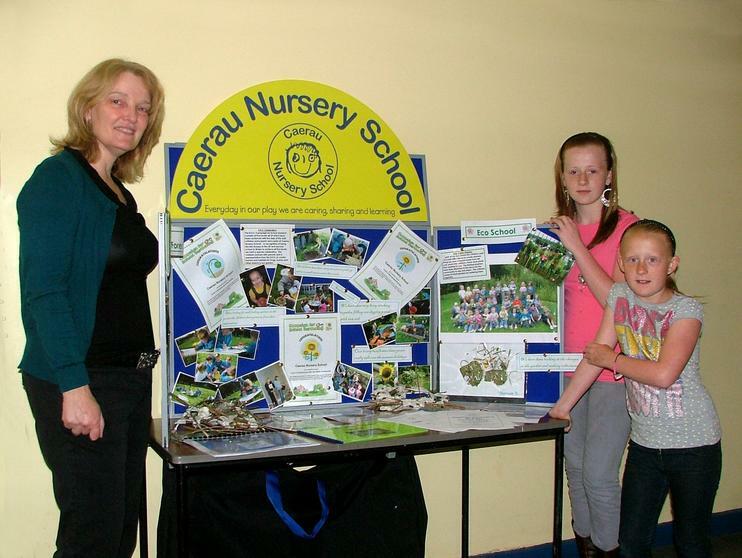 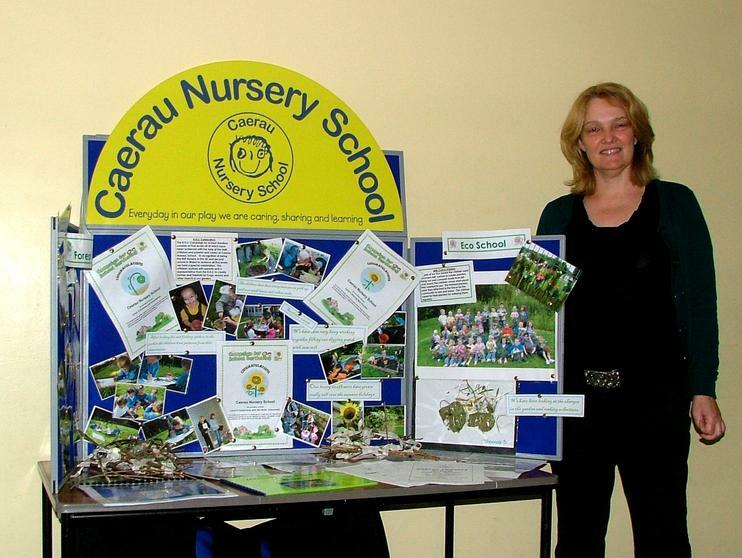 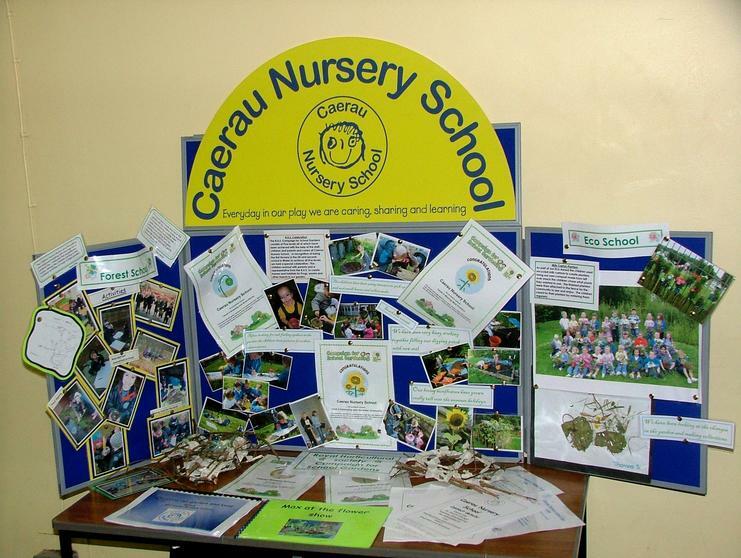 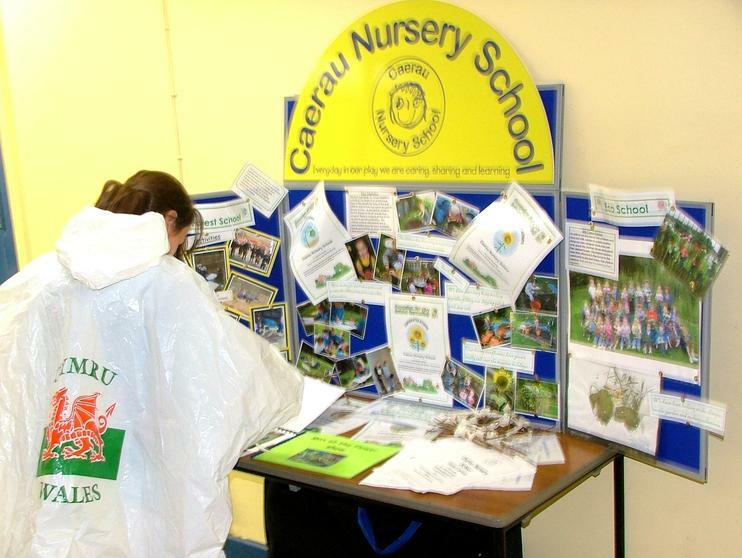 There were other schools represented to Caerau Nursery famous in the area for its quality especially its gardening had a stand showing the lovely things that go on. 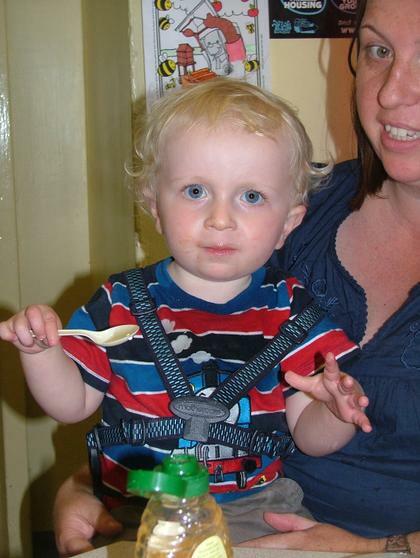 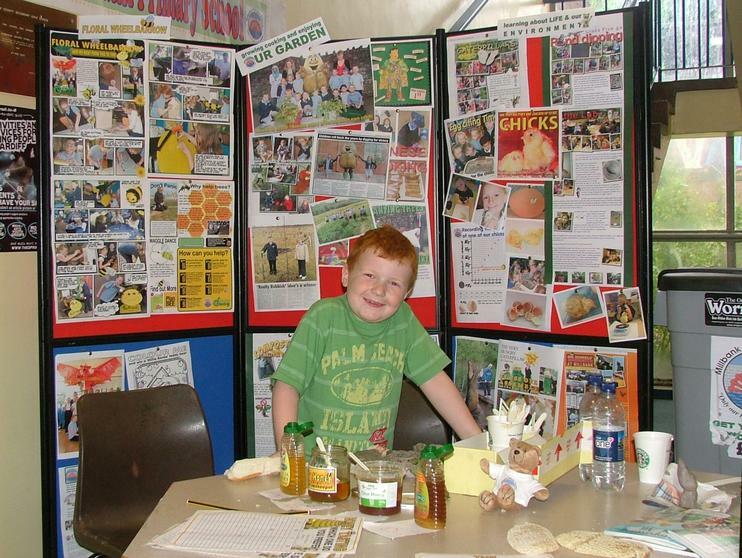 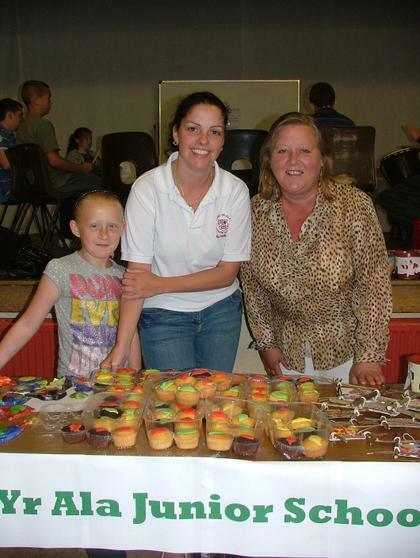 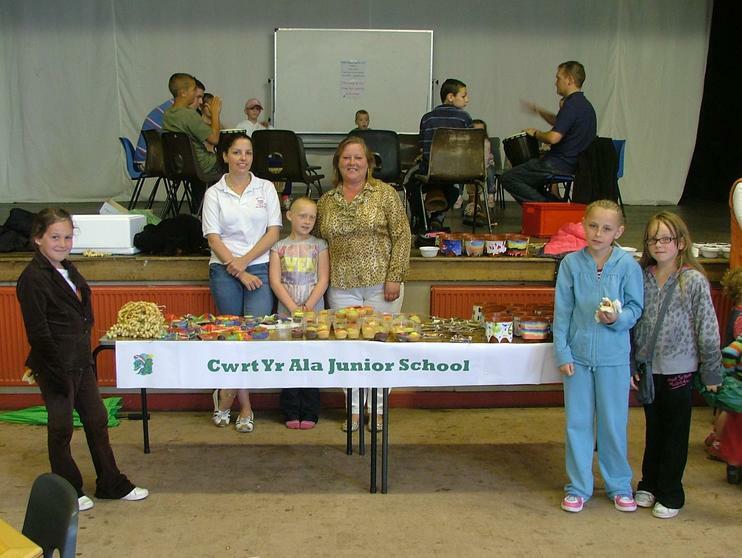 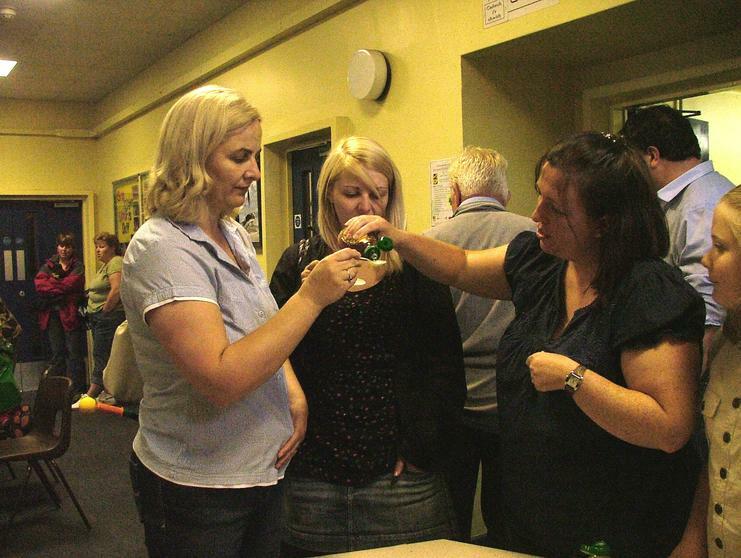 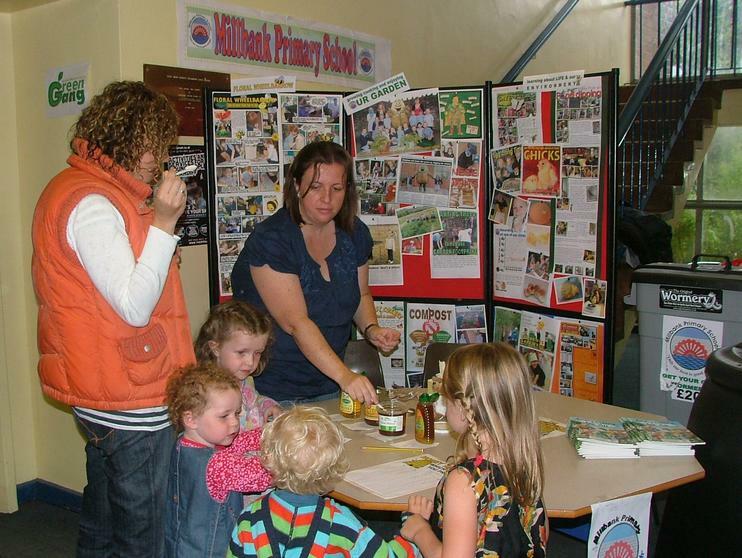 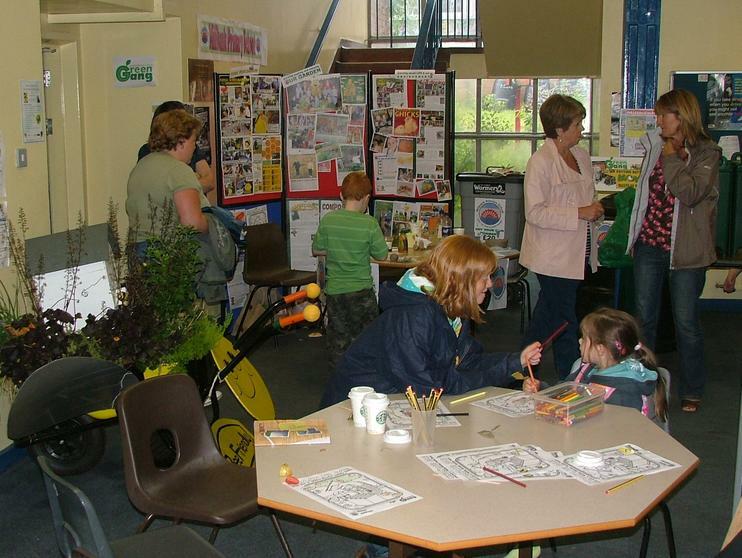 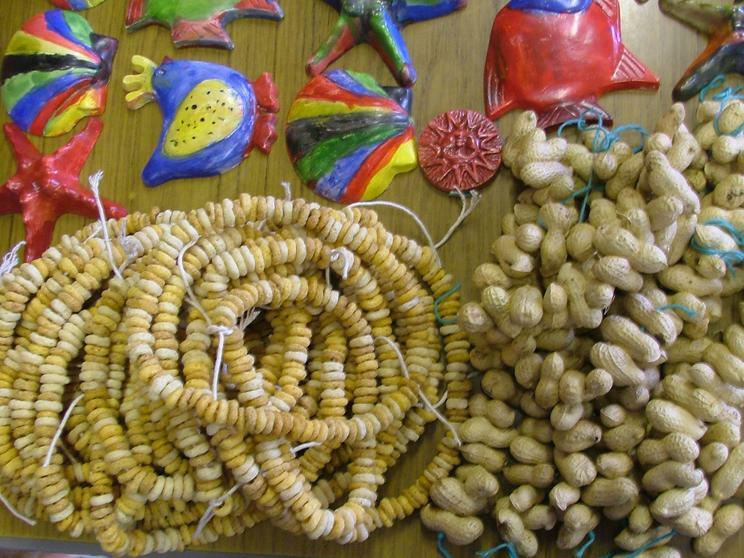 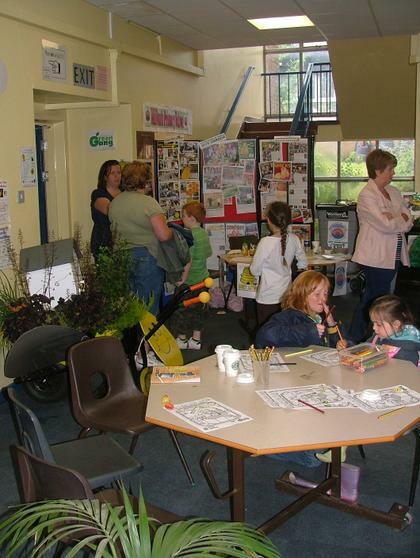 Cwrt-yr-ala had also got some broad beans to give away along with craft items. 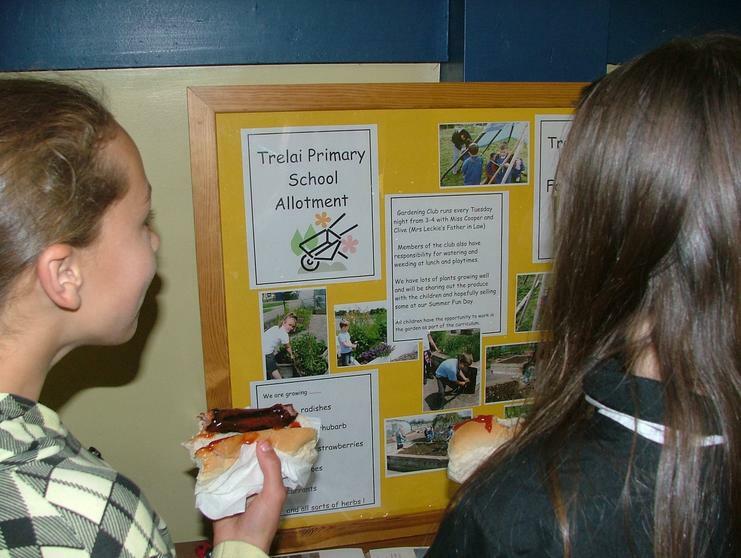 Our friends at Trelai Primary also had a lovely display of their Forest School and their allotment with some fabulous artichokes the children had grown. 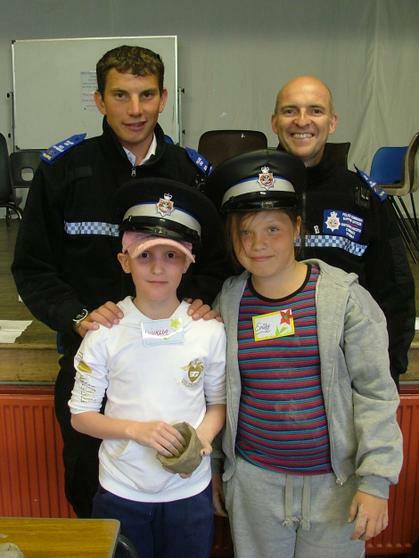 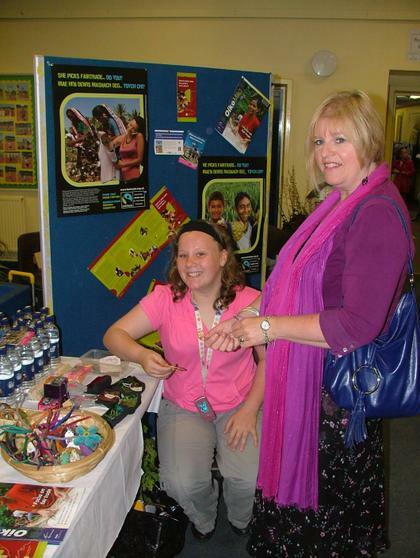 Our Police Community Support Officers PCSO's called in, There was a Fairtrade stall at the school reinforcing the message about the importance of us all choosing the right products for a sustainable future.